Vehicle fires are among the leading causes of death in the United States. Data shows that vehicle fires are responsible for more deaths in the country than apartment fires. In 2006, fire departments in the US responded to approximately 278,000 vehicle fires, which resulted in 490 deaths and 1,200 injuries. Nearly 75% of the fires were caused as a result of inadequate maintenance, malfunctions, and mechanical or electrical failures. Collisions and overturns were only responsible for 3% of the fire but caused 57% of the deaths. Two age groups which are at the highest risk of dying in vehicle fires are older teens and young adults. 33% of non-fatal injuries were caused as a result of civilians trying to put out the fire by themselves. What Makes Vehicle Fires Dangerous? 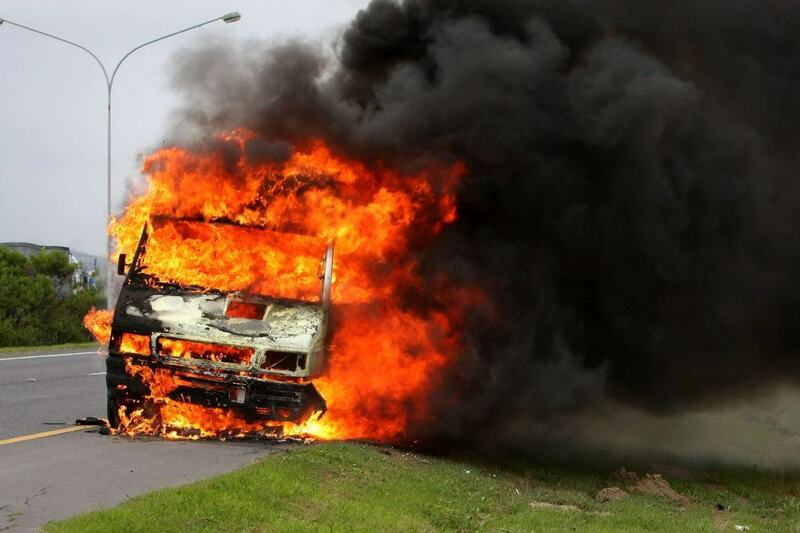 Many people do not seem to understand the seriousness of vehicle fires and the mortal risks involved. 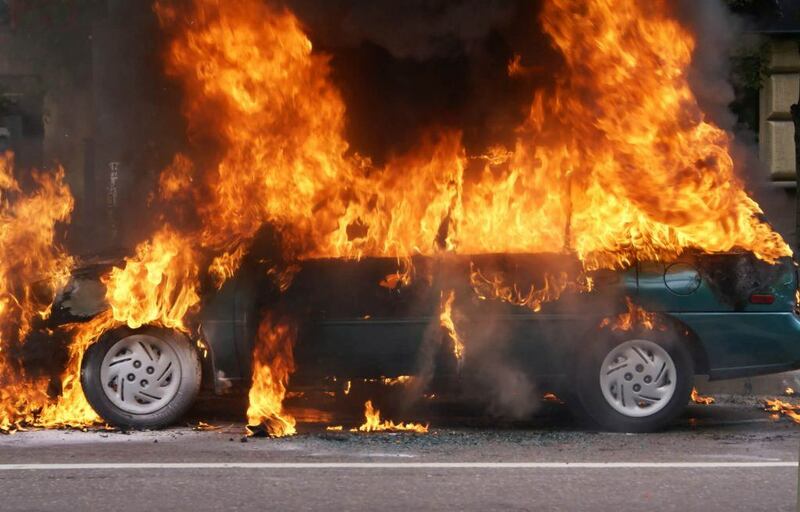 The heat generated in a vehicle fire can be as high as 1,500º F, which can cause fatal injuries. Even the non-fatal injuries sustained in vehicle fires can be debilitating in many cases. When a vehicle is on fire, the flames can shoot out to a radius of 10 feet or even more. The intense heat can also cause some of the parts to burst, shooting out debris in all directions. From drive shafts to tire rims, axle, grease seals, door units, and magnesium wheels, several parts are known to burst under intense heat and pressure. There are many parts in an automobile that are made of synthetic materials. While burning, these materials tend to emit harmful gases, which can be deadly in high concentrations. For example, carbon monoxide, which is a byproduct of fires, can be toxic at low levels and fatal at high levels. The risk of airbag deployment is also extremely high in vehicle fires, which can be dangerous in its own way. Data from the National Fire Protection Association (NFPA) shows that vehicle fires account for nearly 20% of all fires reported. Surprisingly, crashes only account for a minuscule percentage of vehicle fires. In most cases, vehicle fires are caused by fuel leaks or the leakage of other inflammable liquids like brake fluid, transmission fluid, power steering fluid, motor oil, and coolant. The leakage could be caused as a result of normal wear and tear or a shoddy repair job by the mechanic. In the case of a brand new vehicle, these types of leakages can be attributed to manufacturing defects or design failure. In some cases, the fire could be the result of an electrical short circuit. Whatever may be the cause, vehicle fires tend to spread slowly, especially in the early stage. If you are alert, you might be able to escape unscathed in most cases. If you, on the other hand, are distracted, intoxicated, or asleep, you might not be able to do so and can sustain severe or fatal injuries as a result. One thing you need to keep in mind is that car batteries pose a hazard of their own, especially in a vehicle fire. They contain sulphuric acid, which is extremely corrosive and can cause severe burn injuries. They also produce hydrogen and oxygen gases during their operation, which are flammable. If these gases get ignited during a vehicle fire, the resulting explosion can cause serious injuries. How to Prevent Vehicle Fires? The threat of vehicle fires can be avoided to a great extent or eliminated altogether with the help of regular inspection, repair, and maintenance. You should have your vehicle thoroughly inspected by a trained professional on a regular basis. If there is a problem with any part, you should have it repaired or replaced immediately. The electrical system and fuel system, in particular, should be inspected at regular intervals. Any problem in these systems can increase the risk of a vehicle fire exponentially. You should also check your vehicle regularly for oil leaks. You must use a funnel while adding oil. While driving, you should watch out for signs that could indicate a problem with your vehicle. Is the exhaust tone louder than usual? Is the exhaust backfiring? Do you notice a lot of white or different colored smoke coming out of the tailpipe? These are all indications that there is something wrong with your vehicle. So, get it checked out right away. What to Do When Your Vehicle is on Fire? If you notice that your vehicle is on fire, do not panic. Vehicle fires generally tend to spread slowly so you will have enough time to get out of the car safely in most cases. If you are still able to operate your vehicle, slow down and move safely to the side of the road. Do not, under any circumstances, try to move forward. The forward motion can force air into your vehicle’s engine compartment. When it happens, the oxygen in the air can stoke the fire and cause it to spread even wider. So, moving to the side is the safest option under those types of circumstances. Once you move to the side of the road, switch off the ignition. This is a critical step, as it shuts down the two major causes of vehicle fires – electric current and gasoline. Get out of the vehicle immediately. Assist other passengers – young children and elderly people in particular – to get out of the car safely. Once you are safely away from the vehicle, contact emergency services immediately. Do not attempt to go back to the car for any reason. In some cases, you might be able to put out the fire using an extinguisher. It is possible only if the fire is really small and is confined to the interior of the vehicle. Otherwise, it is a hazardous endeavor and should not be attempted. Even in cases where you can put out the fire, you should stand several feet away from the vehicle, aim the extinguisher at the base of the fire, and spray continuously. If the fire is large and is spreading rapidly, you should never attempt to put it out by yourself. Similarly, if the rear-end of your vehicle is on fire, especially near the gas tank, you should not try to put it out, since the risk of an explosion is very high in these types of situations. You need to back away or actually run away in this case. If the vehicle fire is caused as a result of an accident, the seatbelt buckles and doors could be jammed, which can make it incredibly difficult for you to get out of the vehicle safely. However, even in this type of scenario, there are several things you can do to escape unharmed. First of all, you should unlock your vehicle’s windows and doors. Even if you are not able to open them, it will make it easier for other people to get you out. You should unfasten your seat belt as quickly as you can. Otherwise, the heat generated by the fire can cause the metal in the belt to melt, making it impossible for you to take it off. In case you are not able to unfasten the seatbelt, you have to free yourself physically. Grab the shoulder strap, push it well over your head, and duck under it to release your upper body. Similarly, lift up your legs as high as you can and wiggle your body slowly to free yourself from the waist strap. Watch the car fire safety video below for more information on how to respond to a car fire. Manually escaping from a burning vehicle is not an easy task, to say the least. Especially, if you are involved in a car accident and are hurt, getting out of a seatbelt or kicking open a window might be extremely difficult, if not downright impossible. With this being the case, it makes sense for you to have an escape tool with you. You can find a number of car escape tools on the market today. The most versatile tools have three essential features – a cutter (to cut through seatbelts), a hammerhead (to smash windows open), and an LED light (to be able to see in low-visibility conditions). You can choose a waterproof tool so that you can use it even if your vehicle gets submerged under water. Vehicle fires can be hazardous – not just for the vehicle’s occupants, but also for bystanders who happen to be close by. However, if you can stay alert and think on your feet in that precarious situation, you can escape unharmed. The instructions and guidelines provided in this guide could help you escape from a burning vehicle, should you ever find yourself in such an unfortunate situation. Carrying an escape tool with you is a prudent idea because it can make it easier for you to escape from the vehicle and help others to do the same. In the event that you or a loved one sustained serious burn injuries during a car fire, it may be a good idea to talk to a personal injury lawyer to see what your options are. I'm Ed Smith, an auto products liability lawyer in Sacramento. If you have been injured in an accident, please call us for free and friendly advice at 916-921-6400 or 800-404-5400. I am a proud member of the Million Dollars Advocates Forum and of the Top 1%. See our Past Verdicts and Settlements page. Our client reviews are on: Yelp, Avvo, & Google.